This Article challenges the global science standard for putting new drugs on pharmacy shelves. 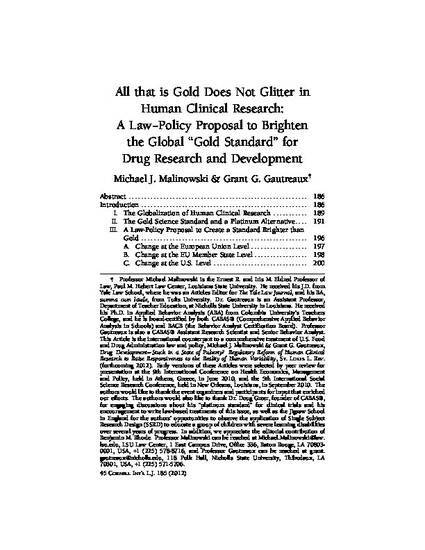 The primary premise is that the “gold standard” of group experimental design is an antiquated extension of drug development’s crude-science past, and is inconsistent with the precision of contemporary genetics— the science that increasingly dominates the drug development pipeline. The Article identifies law– policy options that would raise the standard for human clinical research under the International Conference on Harmonisation of Technical Requirements for Registration of Pharmaceuticals for Human Use. 45 Cornell Int'l L.J. 185 (2012).